The garden looks well kept. Three doves – Colmcilla, Colombe and Takchawee, perch on the suspending swings literally assessing us like the newly installed 3D travellers’ screening machine at the international wing of Accra International Airport. We felt violated. When he finally joins us, he exudes confidence as his well kempt moustache perfectly complements the bewitching youthful smiles. In all, he looks presidential despite the fact that he has relinquished the military power that paved way for democratic rule in the former Gold Coast. Wearing a traditional white attire, he gallantly strolled into his Garden of Eden, just like Adam (before the apple incidence) to take us through his highly controversial administration and exhilarating life in a way that only he can describe. Rawlings served as the President of Ghana from 1979 to 1999. During these twenty years he transformed himself from a military ruler to a civilian politician. There are contending views about his regime and its policies. This interview provides us with his reflections on and attitudes towards his administration and current issues affecting Ghana. His responses mainly were focused on Ghana and its immediate neighbours.The interview started by asking for an assessment of his activities and achievements since he left office almost eight years ago. His response is quite reflectory. “I was invited by the United Nations to campaign about the dangers of HIV/Aids in Africa. Also I was invited to join a few other associations engaged on political discourse and discussions that was going on in the world.” “I have also served as a member of political groups made up of former heads of states. The Interaction Council serves as a meeting place for former heads of states to share their knowledge and experiences of government. However, it is invariably focused on the USA. The African Forum consists of former African heads of states who were democraticallyelected. The African Presidential Archives originated from the efforts of former US Ambassador Steve who had served in Tanzania. The focus of this group has been primarily to create a platform for the communication of ideas and to allow the participants to teach and share their experiences as former heads of states. When I received an invitation to participate in this forum I was unable to leave the country at that time because of the impending false and fabricated criminal charges against me. Of which if I had left the country I would have been declared wanted for crime. But I had to stay behind in order to defend myself. ”The interactive session now beams the searchlight on the major highlightsof the popular Jerry Rawlings presidency. According to him, the regime heled was made up of military men andwomen of integrity as well as civilians. “During my regime, one of the things we did was infrastructural developments,rebuilding of roads, rural electrification,provision of clean water, and access to good education and healthcare.”As a responsible government, we inserted into the regime a sense of accountabilityand integrity, because aunited nation must have a sense of purposeand vision, and generally defiantand demands from its rulers as well as from the masses accountability and integrity.This is how we were able to achieve so much during our regime. Before coming to power, 29% of the population mainly privileged city dwellers enjoyed power supply, when we left the government over 87% of the populationhad power supply. This was made possible by the transformation of our ports and harbours. Ghana after Kwame Nkrumah achieved the best political stability of all times. We handed over power to a democratically elected government after three months of leadership. With the aim that the political level and social justice we empowered would be a lasting legacy for other African leaders and the world in general. But Ghana is at the brink of losing all these due to President John Kufuor’s short sightedness andc orrupt regime. The government of John Kufuor is destroying the roads we built and rebuilding them at four times higher costs than what we used in building them. Most ofthe contracts are awarded as political favours to party members or families,and friends. We used to import rice at about two hundred million dollars a year and thi sresulted in massive rice distribution; we provided the money, secured the lands and invested in this project. But unfortunately someone messed up along the line, and the present government hasused this as a pretext to jail 2 innocent ministers and ceased their genuinely acquired properties. Right now the President’s brother is one of the major rice importers and his daughter is one the major importers of the jute bags in Ghana. Ghana’s leadership was like a pacesetter, angels were made out of an evil government. Another contextual issue is how he reconciled his humanity to the self-aggrandizing powers of the presidency. The ex president smiled and made use of his bragging right. “I was nothing but a simple pilot, yet I did not feel intimidated because I knew my country was full of brilliant and intelligent young men and women who were ready to take the country to the highest level of governance. Contrary to one of the books I read while growing up “the beautiful ones are not yet born” (Ayi Kwei Armah) This book had a great impact on me because I knew right there that so many beautiful ones were very much around only they were not given the opportunity and space to stand up at the political platform. But only the ugly and the corrupt can stand at the platform and oppress these beautiful ones. This becomes the monopoly of the roughs. We achieved so much within a short space of time, that tourism became the third sources of national earning. Because of this transformation and stability in Ghana we developed people of intellect and integrity. I realized that all we needed to accomplish our aim was three months, and after which we handed over power to Hillary Limman. I was tried and jailed.”During this struggle for change in Ghana, President Rawlings identified the forces and factors that propelled him and his colleagues to action. “The principal bone of contention was corruption.This state of things affected all segments of society, including the market which was for the middle class at that time. There was so much corruption in the fabric of the society that managers inflated prices of products and materials to market women. It was alleged that one day a solider wanted to buy a product that was so high, heasked a for price reduction the sellerout of anger and frustration of whatwas happening in the country threwurine on this soldier. I sent soldiers to bring down thestructure instead of killing the people(this was a clear demonstration ofanger from the people against thegovernment, the soldier representingthe embodiment of government, andthe structure, showed lack of organizedfunctioning institutions in thecountry). There was craving for bloodby the masses. This was because when a government misleads its people,the people will come to hate that government. There was an eminent revolution in the air. The situation was so volatile that I was ordered to use an aircraft to terrorize the market women. I had to obey orders. But then I sat in the aircraft for over 30minutes thinking how could this happen,how badly has this country beengoverned. ”While in power, Ghana enjoyed several overtures from the World Bank hence it is logical to inquire about the nature of his relationship with the World Bank. He didn’t mince words inseparating facts from fiction. “The World Bank said that in order for them to continue giving aid and assistance,we must hand over to a multiparty system of g o v e r n m e n t within a year. We had no choice but to compile, it was futile. I was compiled to step in again because the people were waiting on me to do it.”As a past president, his views of the present government in Ghana are quite useful. We asked if the incumbent has consolidated the gains of his (Rawlings) government. “Our past achievements came to nothing; it was a time of great loss. Porter Gus, a former CIA Director in the Bush Administration, came to Ghana to warn the government that corruption was getting out of hand and might result in a coup detat. Months later President Kurfour was invited to USA and President Bush put his hand around him before the press and said “this is a man of vision, a man ready to fight corruption”. Yes, the Bush administration assisted him to steal the 2004 election in Ghana. The question that lumbers in the minds of decent Ghanaians since then was why no international electoral presence was in sight at thetime. And why was Jimmy Carter invited too late? In fact the only monitoring presence seen was the ones formed locally by the ruling government. ghanaians and for the ghanaians. It is wrong for people to slaughter one another. 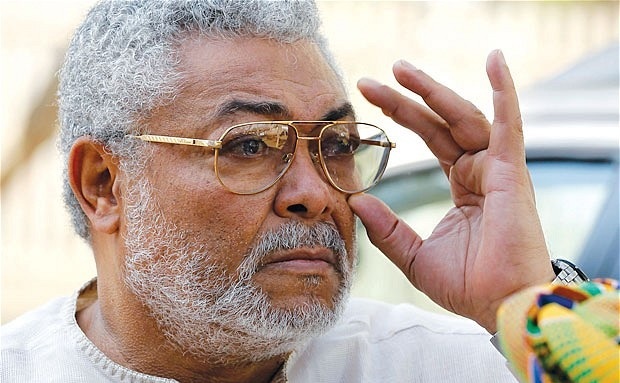 Jerry Rawlings does not believe one ethnic group has the right to slaughter another. According to him, “those lunatic killers must be pursued and brought to justice. A counter slaughter is inhuman and evil because it perpetuates the same evil that the other group committed. Rather, as an effective way of respecting and saving innocent lives would be to bring into justice any group that took it upon themselves to kill another group.”In his view, most of the time, it was the government that instigates this kind of organized hate among different ethnic groups within their respective countries. The case of Rwanda was a typical case at hand. Africa as a nation lacked the power to stop the carnage when it was obvious what was about to happen in Rwanda, but the West kept quite until it was late and millions of people were killed in counter-slaughtering. The world ran away, only Ghanaian troops remained. And this has never been mentioned anywhere in the globe as kudos for those troops. National development and moral responsibility. For any nation to function there must be a clear vision of nationalism, patriotism, access to good education, social justice and affordable health care system. The late Pope John Paul helped to bring down communism in Poland, but healso once said:”the Savagery of Capitalism” poses another danger to humankind”.What is happening in Iraq and South America is a display of Tony Blair and President W. Bush impunity.And this is affecting Africa so negatively in the sense that since most African leaders are followers, they would use the pace set by America and Britain to perpetuate their own people. This was what Pope John Paul was saying about capitalism. This sense of triumphant America creates the idea that might is right. In light of this state of affairs in international politics, the Africans are very vulnerable. Their continent doesnot have the power to pull the brakes. Previous ArticleThe Future Is Now!